Gina Salapata is Senior Lecturer in Classical Studies at Massey University, New Zealand. I have recently studied an aspect of votive practice that has so far remained unexplored: small offerings acquired, dedicated and displayed in multiples. There is a tacit assumption that each dedicant offered only one votive offering on a particular occasion. But nothing prevented a person from occasionally offering more than one object during a single visit to a sanctuary, these presumably being displayed together. In fact, there would be several advantages for doing so. Unfortunately, since small offerings are only very occasionally found in situ, we have little, if any, information about how these were positioned and displayed. Still, revealing clues do exist if we are prepared to see votives not just individually but also as deliberately selected, arranged and sometimes manufactured groups. There is some inscriptional evidence for dedicating multiple offerings (of the same or different type). For example, the inscription on a sixth-century BC bowl from Naukratis mentions two additional offerings made by an individual: Polemarchos dedicated me to Apollo; also the jug and the stand. The implication is that the objects were dedicated together and placed next to each other. A tithe may have also required several objects to be dedicated together. Inventories show that anatomical votives could also be dedicated in multiples by the same person. Were these successive dedications for one person’s organs—a chronic problem perhaps—or were they offered for the sake also of another family member? I have personally, as I expect some readers will also have, lit a candle in a church on behalf of other persons, either alive or dead. Manufacturing techniques and iconographic types, especially of terracotta offerings, allowed them to be used for various purposes; and craftsmen obviously benefited by producing figurines with broad appeal. Many iconographic types are generic, but because offerings derived meaning from context, the same type could have been dedicated to various deities and at different sanctuaries. Additional flexibility would have been provided when individual generic offerings were grouped to produce specific narratives related to the personal circumstances of the dedicant. Large sculptures, often dedicated in groups, provide an example: the Geneleos family portrait group from Samos, depicts on a single base a reclining father, an enthroned mother, three standing daughters and one son. Interestingly, there are corresponding types for such figures among terracotta figurines, suggesting that these types of figurines often represented mortals (rather than gods) who were depicted in conventional poses, according to their social role and status: the father reclining at a banquet, the legitimate spouse and mother enthroned, the nubile daughters assuming the characteristic kore/maiden stance, and the son holding a musical instrument, indicating his aristocratic education. I believe that in some cases votaries could choose generic types like these to purchase and dedicate together, in order to construct their own individual family portrait to place under divine protection and even reflect their social position. Generic offerings may have been made more suitable for specific deities through pairings of two identical or similar types. An example is figurines and plaques depicting a rider, which are appropriate offerings to a variety of gods and heroes since they embodied the ideal qualities of horsemanship. But someone who wanted to give an offering to the twins Dioskouroi, who were often portrayed on horseback, might have chosen to present two of the same riders together, as illustrated here through plaques found in a large votive deposit associated with the sanctuary of Agamemnon and Kassandra at Amyklai in Lakonia. Two different subjects may also have been combined in one set to create an extended narrative. A figurine or plaque representing a mortal worshipper, with or without an offering, was a generic offering dedicated to ensure the repetition of the dedicator’s prayer in perpetuity. If placed next to another figurine representing the honoured divinity, a larger scene would have been created, analogous to those on larger votives on which deities and mortals appear together. Such arrangements would have brought the mortal dedicants, represented by the images of the worshippers, in closer physical proximity with the divinity. Side-by-side placement of generic figurines representing a seated man and seated woman would refer to either a mortal couple asking for divine protection or a divine couple. Such a placement, which stressed the closeness and affection of the partners, might have prompted coroplasts to create new composite types, with the two figures on the same seat; thus, rather than buying two individual figurines the votary could choose a composite figurine. Did the link between the two subjects exist from the beginning or did such a relationship develop with time? In either case, the implication is that these independent images were often dedicated and displayed together. 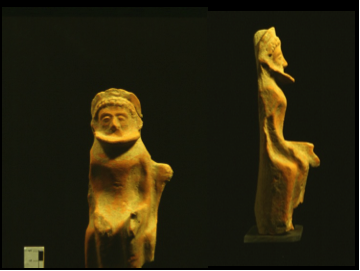 A fascinating case from the Amyklai deposit shows that such a pairing of two figurines was intended from the time of manufacture, for reasons related to the specific cult. This figurine (Sparta Museum no. 6239) represents an enthroned bearded figure with left arm extended. The backrest of the throne is decorated with a frontal anthemion finial only on one side. The finial on the other side is not broken off but must have been eliminated deliberately by the craftsman before firing, probably to accommodate another seated figure, presumably female, placed next to it; her throne would have had an anthemion on the opposite side, as composite examples from other sites indicate. This very unusual technical characteristic of the male figurine suggests that the two figurines were dedicated and displayed together. So, while other figurines found in the deposit show that male and female figurines were dedicated at the sanctuary independently, this figurine must have been dedicated as part of a pair. If this was a common practice for some time, it may have inspired the craftsman in this case to stress the pairing even more by producing a composition showing the honoured heroes sitting next to each other on a single throne, while still using pre-existing molds. The two figurines placed side-by-side would have provided a three-dimensional version of the recurrent seated couple on terracotta plaques from the sanctuary, as seen here. Pottery could also have been offered in multiples. From Samos and Naukratis come some strange-looking cups that resemble stacks of vessels, but were actually made in one piece. They are probably a quick, and presumably cheaper, alternative to offering a pile of separate cups, and imply that people may have given sets of cups that were piled in stacks rather than displayed individually. I hope I have shown that votive behaviour was relatively flexible and worshippers could have dedicated more than one votive offering of the same or a different type during a single visit to the sanctuary, either as a way of enhancing the worth or symbolic value of the offering, or on behalf of family members who could not be there. The availability of various types at workshops would have allowed dedicators to “mix-and-match” offerings to construct their own specific narrative frameworks. 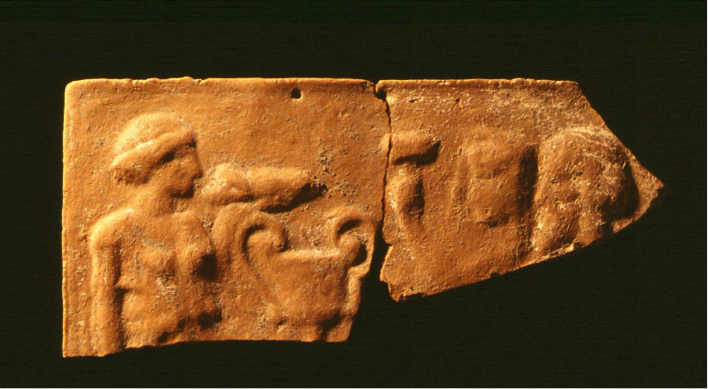 Generic offerings appropriate for several cults could have been dedicated and displayed in intentionally constructed groups in order to produce more specific images that related to the personal circumstances of the dedicant (e.g., a family group) or the character of the recipient deity (e.g., Dioskouroi; divine or heroic couples). Moreover, groupings of offerings could have brought the dedicant physically closer to the divinity (e.g., adorants or offering bearers placed next to deities). I would certainly be very interested in other interesting examples of multiple offerings readers of this blog could provide. Salapata, G. 2011. “The More the Better? Votive Offerings in Sets”. In Australasian Society for Classical Studies 32 Proceedings, edited by A. Mackay, 1–10. Auckland. http://www.ascs.org.au/news/ascs32/Salapata.pdf. Salapata, G. (forthcoming). “Terracotta Votive Offerings in Sets or Groups”. In Figurines en contexte: iconographie et function(s). Lille.